Dinner or breakfast? Well you may be surprised to find out that ‘dinner’ in Old English (disner) means to break a fast and was back then used to describe the first meal eaten in the day. Its meaning later shifted but the word breakfast only came into use in the 15th century to describe a morning meal – literally to break the fasting period of the night before. In the European Middles Ages, breakfast was initially viewed as unimportant; indeed monarchs and their entourage spent a lot of time eating and therefore two formal meals per day were the norm. Eating breakfast was associated with gluttony, which in medieval times was a sin or meant that one was poor (farmers who needed some energy to be able to cope with the morning labour). This practice slowly shifted toward to end of the Middle Ages with morning meals consisting of a piece of rye bread and cheese, and later meat. Caffeinated drinks were introduced in the 16th century and with them the acceptance of breakfast for all! 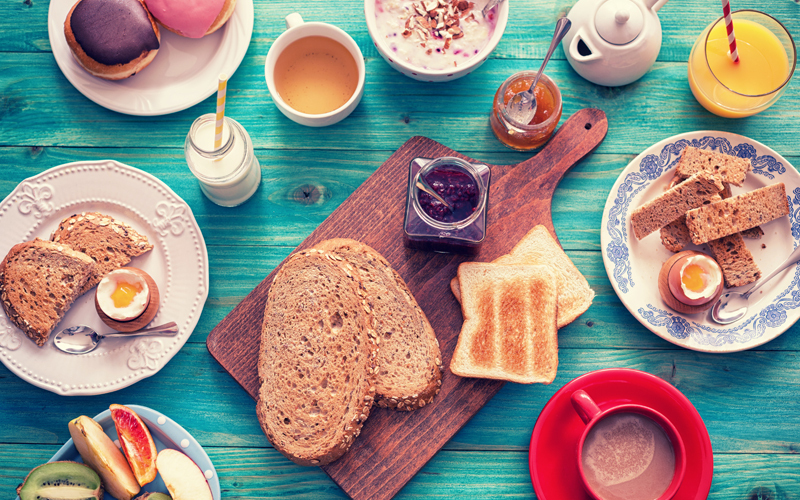 Whilst a fry up and a cup of tea is seen as the traditional breakfast, the reality is that most of us will have a bowl of cereal or some toast with jam or other sweet spreads in the morning. Either tea or coffee are the preferred hot drinks. Nothing is truer than the French clichés when it comes to breakfast which will typically include bread with butter, sweet spreads and coffee, hot chocolate or juice. Pastries such as croissants and pain au chocolat are also popular but are more of a treat. A typical Polish breakfast consists of scrambled eggs topped with kielbasa (a sausage) and potato pancakes. Oladi is the breakfast of choice in Russia. It is a halfway house between a pancake and a Yorkshire pudding, crisp on the outside and soft inside, served warm with soured cream, honey, jam or fresh fruit. Breakfast in Morocco is generally sweet. Bread dipped in jam, honey, dates, coffee or mint tea. On a Dane’s breakfast plate you will often find rye bread, cheeses, salami, ham, honey and jam with Danish pastries of course! Typically, the day in Sweden starts with a yogurt often served with fresh berries, honey or jam. Smoked or cured fish are also often served in Scandinavian open sandwiches. The renowned pancakes with syrup and blueberries still appeal closely followed by a quicker cereal or muesli option. Saltenas are the traditional option for a Bolivian breakfast. These little pasties are usually filled with meat and vegetables and slightly sweetened. Maybe not one for the queasy…. A minty spicy fish with a sweet & spicy pork, served with rice tends to be on offer. No too far from lunch or dinner really. The traditional Japanese breakfast has rice, fish, miso soup, sticky soy beans, and nori seaweed. Tofu is also a popular choice. Morning in Malaysia would normally start with a hot bowl of Mee – noodles mixed with egg, vegetable and tasty spices. Who knew there would be such a variety eh?! So… in which country are you having breakfast next?